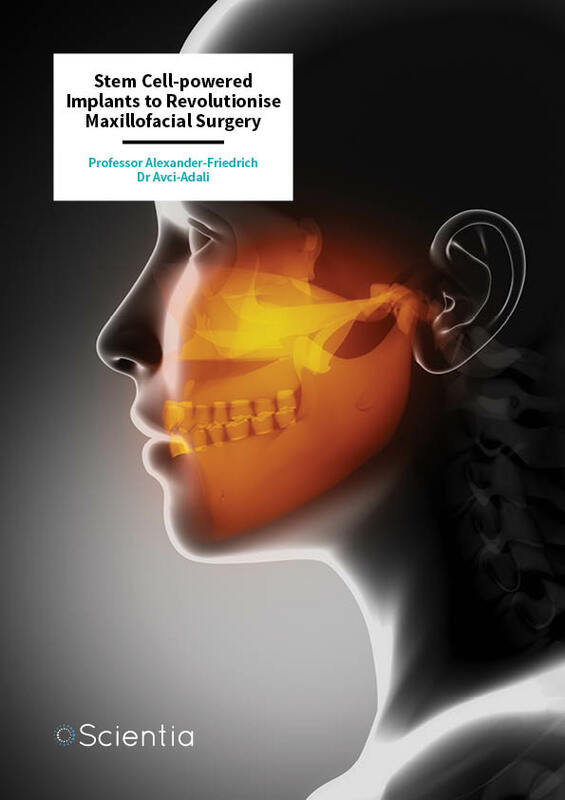 Bone tissue engineering expert Professor Alexander-Friedrich and cardiovascular tissue engineering expert Dr Avci-Adali at the University Hospital Tübingen, Germany, are working to harness the regenerative power of stem cells to improve maxillofacial surgery. Their collaborative research aims to develop a new type of maxillofacial implant that promises to be considerably less stressful for the patient and utilises the regenerative power of the patients’ own body. In Germany alone, more than 10,000 people are newly diagnosed with oral cell carcinoma each year resulting in tumours and in most cases removal of the jaw bone. Other causes of bone defects requiring surgery include tooth loss, bone cysts, and congenital defects such as cleft lips, jaws, and palates. Facial reconstructive surgery, however, is notoriously difficult. The current mainstay of treatment is bone transplantation involving a heavy and/ or gruelling series of surgeries. Surgeons take bone tissue from a patient’s hip, leg, or shoulder blade, sculpt it into shape, and implant it into the bone defect within the jaw. Because the bone comes from the patient’s own body, there is little risk of rejection by the immune system. Usually, the removed bone biopsies will be moulded into titanium splints and fixed within the jaw to maintain face structure. However, it is difficult to precisely match the shape of the bone to the face, and subsequent swelling and other pressures can cause it to sag out of alignment, resulting in significant deformities. Moreover, further surgeries are often necessary, which significantly increases healthcare costs in addition to the patient’s suffering. The procedure of transplantation of the patient’s own bone can also damage the harvest site and often causes chronic pain. To overcome these difficulties, a bone tissue engineering approach represents a suitable alternative. Tissue engineering takes advantage of specialised cells – called stem cells – that can be converted into different types of cells through a process called differentiation. As stem cells can selfrenew and differentiate, they hold great promise for regenerating damaged or lost tissues. All large bones are covered by a thin membrane called the periosteum, which contains bone-producing cells called osteoblasts. It is within the inner layer of the periosteum that the researcher’s stem cells of interest are found. Some of these ‘jaw periosteal cells’, or JPCs, have high rates of bone formation, even in older patients, making them ideal candidates for jaw implant surgery. A fundamental prerequisite for the successful application of stem cells in tissue engineering therapies is a high yield of safe, reliable and good quality stem cells. The team of Professor Alexander-Friedrich isolates the JPC stem cells from tissue biopsies and they are then grown under specialised conditions in the laboratory to maximise cell yields with a high regenerative potential. Furthermore, Professor Alexander-Friedrich identified a marker (called MSCA-1) that could be used to reveal which JPCs have the most potent bone generation potential. By harvesting those cells containing MSCA1, they could maximise the yield of cells with a high bone forming capacity. In addition to the generation of suitable stem cells, which are sufficient for implantation, it is equally important to develop safe and clinically applicable biomaterials on which the stem cells are grown. Professor Alexander-Friedrich and Dr Avci-Adali are together exploring the most suitable implant materials that can mimic native tissue and direct stem cells to regenerate into functional tissue. ‘A promising approach is the tissue engineering approach using stem cells and scaffold materials (biomaterials) for the generation of bone constructs to be transplanted into the occurring bone defects,’ explains Professor AlexanderFriedrich. The two teams are exploring the suitability of different biomaterials for JPC growth and proliferation, as well as adhesion, differentiation, and effects on development potential. Scaffold properties such as porosity and topography as well as mechanical stability are examined and adapted to mimic the natural structure of bone. Professor Alexander-Friedrich’s team’s aim is to combine different biomaterials that allow both elastic and mechanical stability that can withstand the mechanical force that occurs during mastication or chewing. Additionally, in contrast to conventional metal implants, biomaterials in tissue engineering must degrade in a stepwise manner within the body and must be biologically compatible to prevent inflammation and damage to healthy tissue. The team has tested various commercially available materials including collagen, calcium phosphate and polylactide. Dr Avci-Adali’s working group focuses on the use of endothelial progenitor cells (EPCs), which are stem cells that are able to generate the endothelial cells lining all blood vessels in the human body. In her research group, these EPCs are applied for the creation of new blood vessels in tissue engineered constructs as well as in damaged tissues, such as in injured heart muscle after a heart attack, and also for the lining of artificial vascular implants with endothelial cells. Moreover, the implant surfaces are covered with biomolecules in order to line the blood-contacting surfaces with endothelial cells or to induce homing of patient’s EPCs to the implants and to improve vascularisation. The biomaterial, which creates a three-dimensional structure for the incorporated cells to live on, as well as the supply of these cells with nutrients and oxygen and the removal of waste products, plays an important role in the successful regeneration of tissues. Thus, the formation of new blood vessels in the scaffolds can ensure the viability and functionality of the incorporated cells. Furthermore, the cell and blood tolerance of biomaterials used for the formation of new tissues have to be analysed extensively prior to clinical applications. Dr Avci-Adali’s group has extensive expertise in the analysis of cell and blood tolerance of different implants and biomaterials, such as hydrogels, vascular implants and prosthesis. Different tests in the laboratory, such as static and dynamic tests, are used to evaluate the blood tolerance of new biomaterials according to ISO-10993 standards. Using a reprogramming process, four factors can be introduced into the patient’s fully differentiated cells, such as skin cells. These factors work together to alter specific cell activities, thereby switching the cellular identity from the differentiated, fully developed, later stage cell, back into an early embryonic stem cell (ESC)-like state. These cells are called induced pluripotent stem cells (iPSCs) and have the potential to differentiate into different types of cells, such as nerve, bone, heart muscle, and liver cells. The application of iPSCs offers two main advantages compared to ESCs. 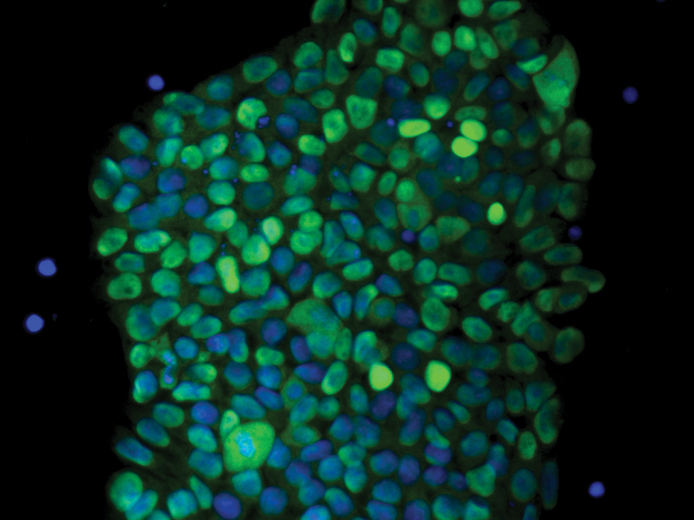 In comparison to the ESCs, the generation of iPSCs does not require the destruction of embryos. Thus, the major advantage of the use of iPSCs is the elimination of ethical issues, since the cells used for the reprogramming are harvested from a willing adult by a simple tissue biopsy, such as a skin biopsy. Furthermore, iPSCs are generated from a patient´s own fully differentiated cells, thus, no rejection reactions are expected. Dr Avci-Adali’s research team develops sophisticated methods for the modification and capture of cells on implants. For the modification of cells, the team uses synthetic nucleic acidbased molecules, such as self-replicating ribonucleic acids (RNAs) to produce the desired or missing proteins in cells. The most important advantage of this technique is that it is a foot-print free method. The synthetic nucleic acid molecules are only transiently present in the cells and in comparison to other methods that use a viral-based modification of cells, there is no integration into the genome. Thereby, integration related mutation of cells and the occurrence of cancer is prevented. Thus, this method represents an interesting technology for clinical applications. Furthermore, Dr Avci-Adali’s research group uses nucleic acidbased small molecules, called aptamers, to capture specific cells on biomaterial surfaces. Therefore, biomaterials are created with aptamers designed to bind specific cells. This technology leads to the colonisation of biomaterials with the required cells promoting and improving tissue regeneration. The experimental procedure: Human jaw periosteal cells (JPCs) will be isolated and grown under specific conditions. 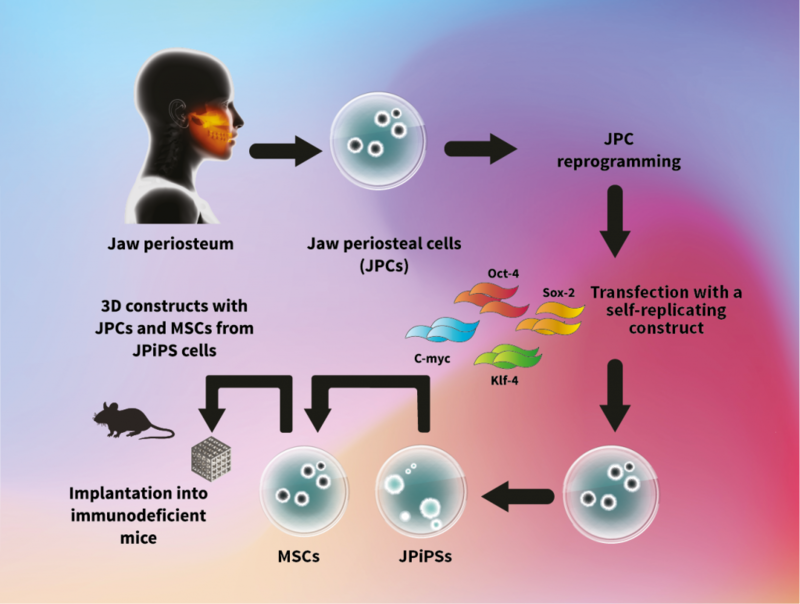 JPCs will be then reprogrammed into jaw periosteal induced pluripotent stem (JPiPS) cells. JPiPS cells will be differentiated into mesenchymal stem cells (MSCs) and then seeded into 3D constructs to generate bone constructs following implantation in immunodeficient mice for biocompatibility testing. Professor Dorothea Alexander-Friedrich and Dr Meltem Avci-Adali, experts in tissue engineering at the University Hospital of Tübingen, are developing a new generation of biological implants. Their goal is to provide an implant that can seamlessly integrate into the patient’s own bones and tissues, requiring only a short surgical procedure to insert, therefore preventing additional surgeries in other parts of the body. The collaborators are pushing the boundaries for harvesting stem cells with maximum bone regeneration potential and they are exploring different biologically active coatings for implant materials that can promote the growth of cell populations, thus maximising the chances for successful treatment. In their current German Research Foundation-funded study, the teams are exploring ways to convert the isolated JPS cells into an earlier, more embryonic-like state with increased potential for developing different cell types. These embryonic stage cells, or iPSCs, have the ability to develop into any cell type of the body. Dr Avci-Adali describes how the, ‘aim of the present project is to develop a patient’s own iPSCs. These stem cells show in comparison to those isolated from the bone membrane, a higher growing capacity with the ability to generate different cell types including bone cells.’ Thereby, sufficient cell numbers for large tissue engineering implants can be obtained from the patient’s iPSCs. Having successfully generated iPSCs from bone membranederived cells, the teams’ next steps are to fully assess these cells and better understand their bone-forming capacity. Using these cells, the researchers will generate three-dimensional tissue engineering constructs with high regenerative potential, to maximise the success of implantation. When the optimisation of cells and biomaterials is complete, the newly developed implants will be first tested in animal models before moving on to human clinical studies. The team will test different three-dimensional tissue scaffold biomaterials seeded with mesenchymal stromal cells (MSCs), generated from JPCs derived from iPSCs, by implanting them under the skin of immune-compromised mice to assess how well the cells/biomaterials are tolerated in the body and can generate bone tissue. The restoration of individual tissues or organs through tissue engineering holds great potential for the future of medicine. The new generation of three-dimensional implants developed by Professor Alexander-Friedrich and Dr Avci-Adali will contain patients’ own cells that have been coaxed to form the necessary cell types and tissues for restoring patients’ normal body function without immune-rejection. This exciting approach will help the implant site to repair itself much more effectively than has ever been possible before. 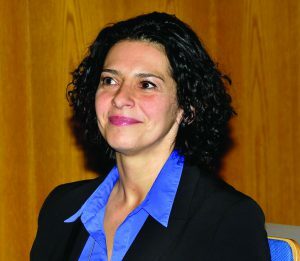 Professor Alexander-Friedrich completed her PhD, investigating factors involved in the pathogenesis of rheumatoid arthritis disease, at the Department of Orthopaedic Surgery of the University Hospital of Tübingen in 2003 and continued her post-doctoral studies at the faculty. She has held the position of Head of the Research Laboratory of the Department of Oral and Maxillofacial Surgery, University Hospital of Tübingen since 2005 and was awarded a professorship in 2017. The focus of Professor Alexander-Friedrich’s research is bone tissue engineering. 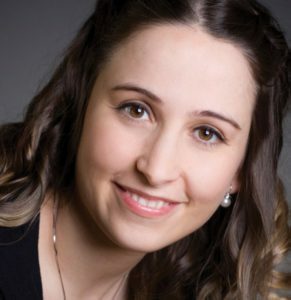 Dr Avci-Adali studied a Diploma in Pharmaceutical Technology and then received an MSc in Biomedical Engineering in 2006. She was awarded her PhD in Biology from the Eberhard Karls University of Tübingen in 2010. Since 2010, she has led the groups, ‘In vivo Tissue Engineering’ and ‘Aptamers’ at the Department of Thoracic and Cardiovascular Surgery, University Hospital Tübingen. Her research interests include tissue engineering and the use of aptamers with a view to developing new methods for applications in the cardiovascular field. M Avci-Adali, G Ziemer and HP Wendel, Induction of EPC homing on biofunctionalized vascular grafts for rapid in vivo self-endothelialization – A review of current strategies, Biotechnology Advances, 2010, 28, 119–29. X Guan, M Avci-Adali, E Alarçin, H Cheng, SS Kashaf, Y Li, A Chawla, H Jang, A Khademhosseini, Development of hydrogels for regenerative engineering, Biotechnology Journal, 2017, 12, doi: 10.1002/biot.201600394. H Steinle, A Behring, C Schlensak, HP Wendel and M Avci-Adali, Concise Review: Application of In Vitro Transcribed Messenger RNA for Cellular Engineering and Reprogramming: Progress and Challenges, Stem Cells, 2017, 35, 68–79.